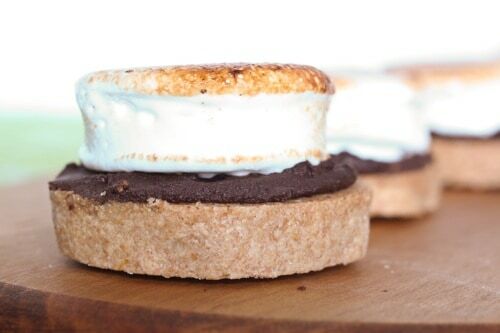 Lemon Ginger Shortbread S'mores | Good. Food. Stories. He was pretty angry at having to cross four lanes of traffic so I could barf along the side of the road on the Schuylkill Expressway. He probably never knew about all the times I held it in until we paused at a rest stop. But I don’t think my dad will ever forgive me for yakking in the back seat of his Porsche. To be fair, it wasn’t the first time I had tangled with motion sickness and lost, so my dad and stepmom were somewhat prepared for what was going down. A beach towel (why did we have a beach towel when we were taking a trip to Toronto? Still a mystery.) was quickly thrown into my lap, though not quick enough to offset all the damage. My Mickey Mouse sweatshirt and denim skirt also took a pretty direct hit. It was only after this particular instance of breakfast suddenly meeting Porsche leather in a spectacularly violent fashion that my parents started putting two and two together. Casey is a nerdling who reads in the car… Casey is a sensitive flower who always throws up in the car… DING DING DING. Thus began a lifetime ban from cracking a book on any car trip, even to the grocery store or (gasp!) library. The Walkman, then later the Discman, then later the iPod became my constant travel companion. I got to be scarily adept at dropping into a deep catnap on any moving vehicle. This is how overly ambitious dishes come about. If, say, the concept of s’mores drifts idly through my brain, why wouldn’t I start thinking about graham flour, and how maybe you could make a shortbread cookie with it? Or how a little lemon zest… and ginger?… might make their way into that cookie? And at this point, it would be silly not to add some ginger to the chocolate layer. Which means that the marshmallow on top should definitely taste like lemon. Why not? If you’ve never attempted homemade marshmallows, and you’ve got a stand mixer, a candy thermometer, and a bit of an adventurous spirit, I strongly urge you to try it just once. The big hurdle for most home cooks is finding gelatin sheets, which have a sturdier protein structure than egg whites do and give the marshmallow its signature bounce; the gelatin makes a stronger, more shapeable goo that won’t weep moisture or deflate over time. Honestly, the shortbread is fantastic on its own, and if you wanted to make it a softer, chewier cookie, just omit one of the cups of graham flour. Topping it with lemon curd and a blob of homemade marshmallow fluff (no gelatin or stand mixer required) makes it a lemon meringue cookie instead of a s’more-stravaganza. Oh, and ginger is a natural digestive—dare I suggest bringing a few along on your next road trip? You might also want to bring a beach towel, though; I make no guarantees. Beat the butter and sugar together in the bowl of a stand mixer with the paddle attachment on medium speed for 2-3 minutes. Stir in the lemon zest and ginger on low speed. Mix the flours and salt together in a small bowl, then slowly add to the stand mixer bowl while stirring on low speed until a crumbly dough forms. Shape the dough into a log about 2 inches wide and 12 inches long on a sheet of plastic wrap, then wrap tightly and refrigerate for at least an hour. Preheat the oven to 325˚ and line two baking sheet with parchment paper or Silpats. Cut the log with a sharp knife into 1/4-inch rounds and place on the baking sheets. Bake for 18-20 minutes or until the cookies are just hinting at golden brown around the edges. Remove the cookies from the baking sheets and cool on racks. Bring the ginger and cream to a simmer in a small saucepan over medium-low heat—it will only take a minute or two for bubbles to form—then remove from the stove, cover, and let sit for 20-30 minutes to allow the ginger to infuse its flavors into the cream. Make a double boiler by filling a small saucepan halfway with water and bringing it to a simmer. Strain the infused cream into a heatproof (metal or aluminum) bowl and add the chopped chocolate. Place the bowl over the simmering water, making sure the bottom of the bowl doesn’t touch the water, and stir constantly to melt the chocolate. Spread warm chocolate on one side of each cookie with a knife or offset spatula. For mini marshmallows or small discs/squares for the s’mores, grease a 9×13-inch pan with shortening and coat lightly with cornstarch, tapping out the excess. For big, fluffy cubes, do the same to a 9-inch square baking dish. Soften the gelatin sheets by submerging them in a heatproof (metal or aluminum) bowl filled with ice-cold water and a few ice cubes thrown in for good measure. Make a double boiler by filling a small saucepan halfway with water and bringing it to a simmer. Divide the corn syrup, pouring 1/2 cup into the bowl of a stand mixer and stirring the other 1/2 cup into a medium saucepan along with the granulated sugar and 1/2 cup water. Clip a candy thermometer to the saucepan with corn syrup, sugar, and water, and place over medium heat. Keep an eye on it, stirring gently as it comes to a boil. As the sugar syrup heats up, drain the gelatin, squeezing gently to wring out excess water, and return to the heatproof bowl. Place the bowl over the pan of simmering water and stir to melt the gelatin. Add the gelatin to the corn syrup in the stand mixer bowl and stir with the stand mixer’s paddle attachment on low. When the sugar syrup reaches 235˚ (soft-ball stage) on the candy thermometer, remove it from the heat. Increase the stand mixer speed to medium and drizzle the sugar syrup slowly into the bowl. Be careful to do it slowly, so screaming-hot sugar doesn’t fly all over the kitchen. Increase the stand mixer speed to medium-high and beat for 5-6 minutes, watching the marshmallow goo turn from off-white and frothy to light, shiny, and fluffy. Add the lemon extract and salt in the last minute of mixing. Grease a spatula to help pour and spread the marshmallow goo into the prepared baking pan. Using a small mesh strainer, dust the top of the marshmallow lightly with powdered sugar and let sit for 8 hours so the marshmallow can set. Cut the marshmallow into squares or stamp out discs with a cookie or biscuit cutter to fit the shortbreads. Melt the chocolate and one side of the marshmallow lightly with a kitchen torch, then sandwich the two melted sides together to adhere. 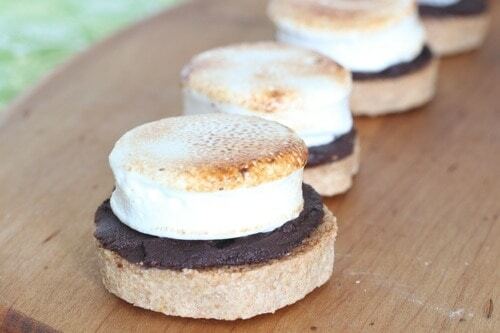 Burnish the top of the marshmallow to a gorgeous golden brown with the kitchen torch and serve. The completed s’mores keep for at least two days with no ill effects.